Alright. Finally plugged in a plan to the computer to try to follow. 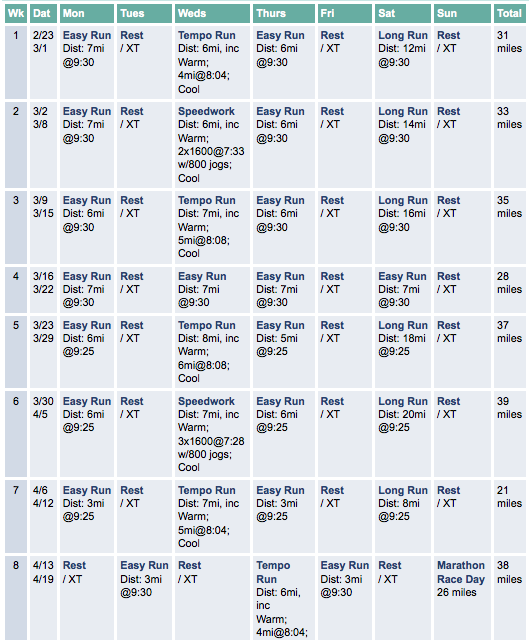 I’m not going to do speedwork or tempo runs for a few more weeks – just easy runs. 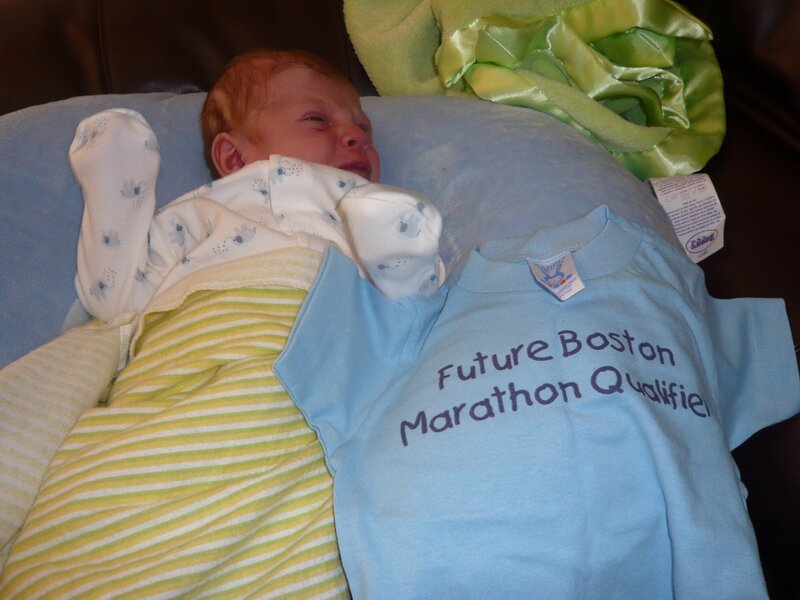 Goal for Boston – finish and be comfortable – have fun and raise lots of $! Here’s my plan above. Advice and thought accepted willingly! It is bare minimum to get me to the finish line! I am going to try 8 to 12 this weekend. More likely to be 8 or 10. I don’t know how I’m going to get in those real long runs by myself but I do know I have to get outside for them! I think I will feel confident as long as I get outside for at least a couple of them. I ran inside all last winter except for long runs and had a great spring! My running bud Abby came to visit today and brought a fun outfit for Nick from her and our other runner friend Ali! Both of them are running really well and training for the NJ marathon. I can’t wait till I can run with her again soon! She’s too speedy right now! I love her Ironman jacket. I got in 5 miles just under 10 min/mile pace and 2 later in the afternoon around the same pace. I’m tired though, this little peanut didn’t give me much time to myself today!! BOB just came from the UPS man!!! YAY for the BOB!!!! so exciting 🙂 cant wait to see a pic of you and nick out running :)looks like a great plan!! That is a cool shirt for Nick. Your plan sounds great! you. are. incredible. the plan looks great you will rock it! WOW! You are my inspiration for when i have a kid. Your seriously doing amazing. You have to have Bill take a pic of you and lil nickles out running when you get the BOB. Even if its just a fake quicky pic, you gotta do it. The BOB is the neatest invention for mommy runners! I’m excited for you!! Good Luck on your run this weekend! Plan looks great. You’ll do really well at Boston. Hopefully you enjoy the training and it goes well. I can’t imagine fitting it in w/ a newborn! Perfect timing on the picture!Seems like a good training plan to me – looking forward to testing out the Bob with you soon. Cute picture. I think your plan looks good. I am debating whether if running my last 22 miler two weeks before is good, it looks like you have the same thing planned. Happy training! Love the shirt! It is too cute! I think that’s a smart decision about holding off on speedwork for a while yet. It definitely looks like your plan will get you to the finish line. Love the shirt for nick – I might need one of those too! !So running has been going good? No pain in your ab region or anything like that? So glad things are going well!! Love the shirt. I want one for Zach. I think it’s smart to avoid speed work right now. Your body has already been through enough. good attitude about doing it but doing it smart…i’ll be curious to hear how the longer runs feel for you. and…don’t do the long runs with BOB yet! i’ve only run with it a few times but it does kind of change your form…and slow you down…especially up hills. still, it’s GREAT. if it were warmer. Omigosh, that is the cutest shirt ever! How perfect for a son of a runner. Hehe. Good luck with your training. I think it’s a great plan for you!! Awwwhhhh isn’t that the cutest shirt ever! Cute shirt!Ok, I’m such a slacker bc I haven’t mailed that snugglie thing yet but I’ll get on that today! !And as far as sleep goes- I’m getting a decent amount. Moana’s sleeping now from 8:15-5:00(ish) so we go to bed by 9:30 and then I’m up about 5:00. When Moana was really little I was up feeding her at 11 and then 2 so I was way more tired then! Cute clothes all around!I’m way excited about your BOB, so you’ll have to let us know how you like it. Good plan and approach to Boston. And yay for BOB. Get ready to rock the BOB. The training plan looks great. You’re so brave for attempting this challenge so soon after giving birth- much braver than I. = )And how adorable is that shirt?! What a cute gift.Sounds like you’re getting in some decent mileage already. I’m sure you’ll be fine on your long runs, as long as you take it slow. And I can’t wait to hear all about the BOB! Love the shirt. You’re doing great. 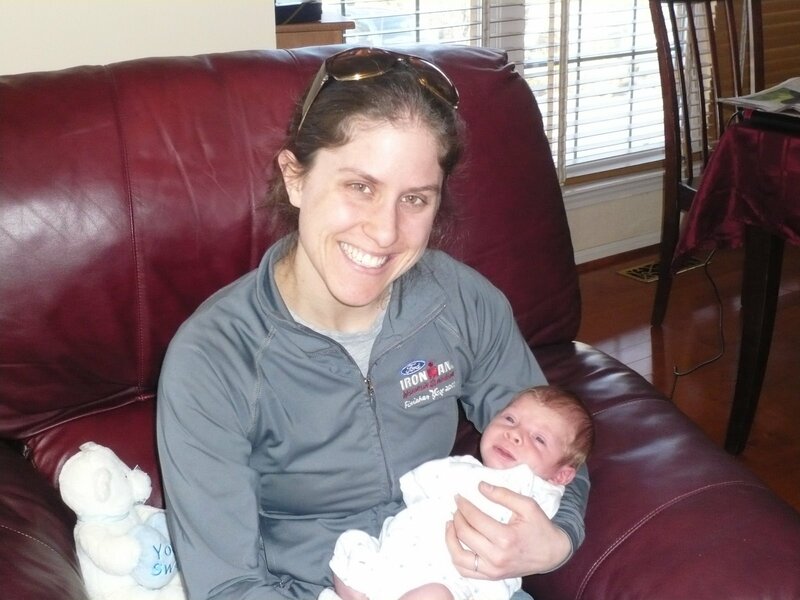 Soon, you will be a stronger runner than you were before you got pregnant. At least that’s what all my running/mommy friends tell me. Yeah, easy and comfortable. I’ll believe it when I see it. Nice and easy on the long runs and you’ll do fine.